Even though it may seem easy peasy for many, making an efficient pistol for concealed carry isn’t that easy. If your weapon is too small, it becomes easy to conceal, but you lose the accuracy and easiness on shooting. By contrary, if the pistol is too large and difficult to conceal, you’re going to find it difficult to carry it for a long time. You do shoot well and precise, chambered in a full power round. In a nutshell, a good concealed carry pistol is the result of the right combination between size, comfort (both when firing and carrying) and just the right quantity of firepower in a substantial cartridge. When forced, you may get some help from small pocket pistols just as well, but you need to realize the limits on everything but comfortable carry and concealment. Taking a closer look at the Glock 27, we see the IWB (inside waistband) holster that is so popular among the users. It’s very common for some states to carry a concealed weapon that is entirely concealed, as you don’t want an imprint on your clothing. A good holster has to fit well your body also and many models aren’t comfortable for all day carry and to mention the inability to fully conceal your gun. The versatility of the IWB is one of its best features as it fits almost any body type and sits so cozy between your pants and underwear, with no imprint whatsoever. You may also find holsters with tuck able features, giving you the chance to look also nice in a dress while carrying your pistol. A top-level IWB holster lets you safely remove and remount the Glock, with only one hand. You only need to pay attention to the details when shopping, as they can really make the difference between great carry and common carry of your Glock 27. Compact and with a nice low profile, the Concealment Express IWB KYDEX Holster is a good option not only for your Glock 27, but also for 26 or 33 Glock. 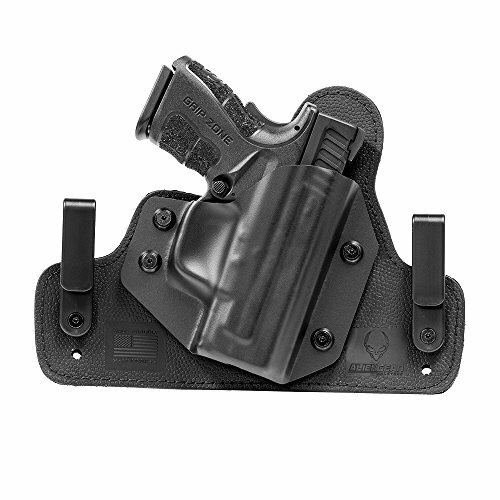 The IWB holster comes with retention pressure that is easy to adjust and a customizable carry angle (cant) ranging from 0 to 15. 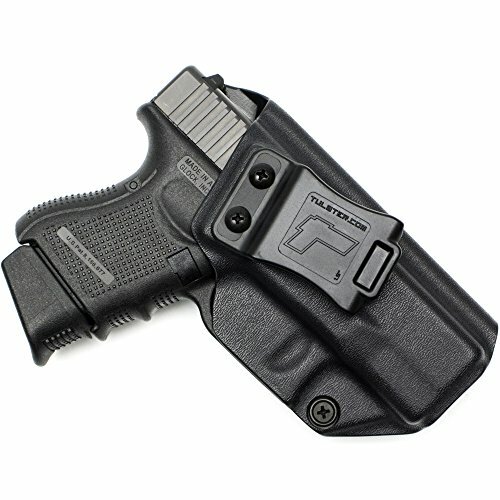 The detailed description of the holster shows us a 1.5” belt clip and a tough and reliable Kydex as material. The “Posi-Click” audible retention lock system is a full sweat shield, efficient and dependable. The holster has a minimalistic, yet efficient design and protects your weapon from moisture, without losing the durability or adding extra weight. The holster is comfortable to wear the whole day and hides pretty well, no matter your style. The retention is built in the trigger and the sight channel is quite good. The holster is easy to put on/take off and the holster doesn’t move either. The belt clips are tough and the holster presents nice fit and finish. Made from start to finish here at home in our USA, the holster is a great option for a very good price. All things considered, for a good price, you get a dependable IWB holster for your Glock 27. 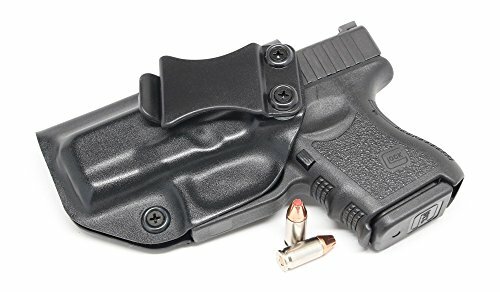 There are many good things to consider when looking at the Alien Gear Holsters Cloak Tuck 3.0 IWB Holster and only few minor drawbacks to keep an eye on. The holster is made here at home in our USA and it’s a durable and dependable option for your Glock27. As it’s award winning, Cloak Tuck 3.0 means high performance in comfort and concealment, more than anything else. The inside-the-waistband gun holster is made with neoprene and a flexible base. The list of good things begins with the adjustable ride height, cant and the retention and continues with the back pad neoprene that is also waterproof. You don’t need to break in the holster also. The spring steel and ballistic nylon with non-warping flexed make the holster firm, yet flexible so that you carry safely your pistol. The top surface is thermoelastic polymer surface that protects your pistol and eliminates risks for marring the finish. We like the retention shell that is especially made for your firearm. The retention is adjustable and you may set the draw you need. The universal shell system allows you to swap shells for various models, meaning you may carry various pistols with just one holster. The holster is comfortable even on bare skin and doesn’t move around. The setup is good and its clips are tough. The durability of the materials give you a holster that serves you good for quite some time. The minor issues sure don’t minimize the overall value of the holster that is comfortable, flexible and so versatile for safe carry. The great fit and finish that the Glock 26/27/28/33 Holster – Tulster Profile Holster IWB presents are the main qualities of this holster. The holster comes with several good things though and the adjustable cant (0-15 degrees angle) is another one of them. The forward hole is oblong so that you may choose any angle ranging from 0 to 15 degrees. The adjustable positive retention point is functional and it’s good to know you gun is fully holstered when you hear the “click”. The retention screw is adjustable so that the firearm stays secure when holstered. The full sweat shield for re-holstering gives you indexing point and lets you keep clothing out of the opening. Let’s not forget the 1.5” Quick Clip for a fast and easy take off the weapon. 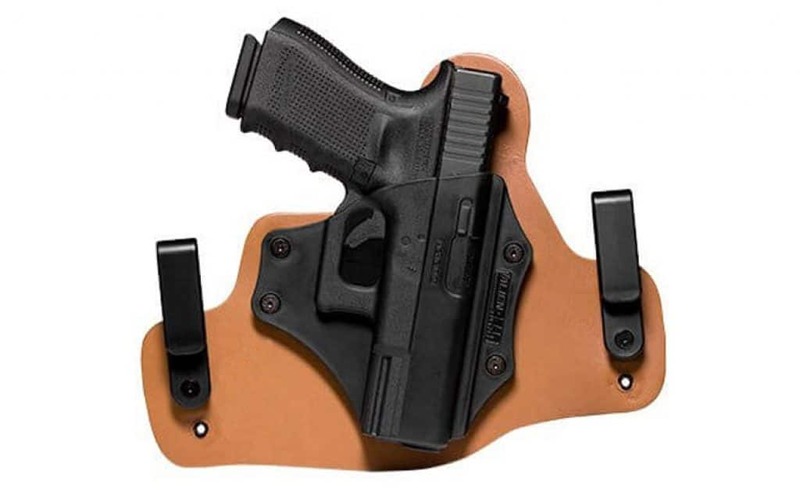 The holster has a high-concealable design and a nice, matte edge finish. The minimal usage of material ensures the good fit and maximum concealment. The holster gives a snug fit, with low drag. The trigger guard is undercut for a higher grip on the firearm, so that the magazine is released even though the firearm is entirely holstered. The belt clip is injection molded and the soft loop option add up to the list of functional features. Despite the minor cons, we still recommend the holster as a great option for your Glock 27 due to its great fit and finish, more than anything else does. Especially designed for the right-handed use, the Galco KT224B Kingtuk Inside the Waistband Holster is still a versatile holster as it fits so many models: 17, 19, and 22,23,26,27,31,32,33. 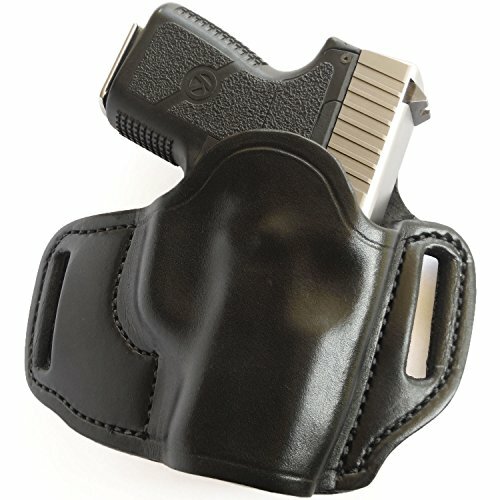 The holster is made with Napa Leather, Kydex, which means it, takes the intense use well, and it also looks nice. The popularity of the holster comes for sure from its comfort, speed and efficiency on so many modes. 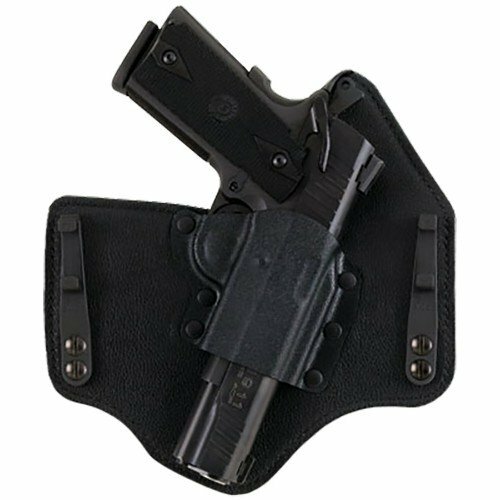 The patented King Tuck gives a comfy blacking plate made of lined saddle Napa leather front with tough Kydex holster pocket. The holstering and drawing are fast and easy. You may wear it inside your waistband and its removable metal belt clips may be moved up or down, depending on holes in the leather. Therefore, you may set the carry height and angle it to suit your needs and wants. The stitching around the borders is well done and the holster is well made. It has a rather small footprint and gives a good hold of your firearm. It provides good coverage of the trigger and the belt clips are adjustable. The leather on the holster is good quality and the holster is made here at home in our USA. All in all, for a good price, you get a dependable, versatile and comfortable IWB holster for your Glock 27. Durable as it’s made of tough leather, the ActiveProGear Dual Slot Open Top Belt Holster gives secure and concealed carry, in a comfortable way, every time. The holster sets apart from the others with its open top design along the full-length molded front sight channel. This gives you speed and smooth operation just as well. The dual belt slots keep the gun close to the body for better concealment. We like the holster as it’s contoured to the natural curved shape of your hip, increasing your comfort. The full-length molded front sight channel secures your sight for faster draw. The molding of the holster is done on the front side and gives a low profile for best comfort throughout the entire day, no matter how large the gun is. The full muzzle coverage increases safety. The holster is made from high-quality American steer hide. It’s a double-layered holster, with very well made stitches. The quality of the leather and the craftsmanship are impressive. The holster is a good option for open carry. For the durability and special design, the holster is a good investment for your gear.